We open up volunteer applications on a seasonal basis, scroll down to view our current opportunities! 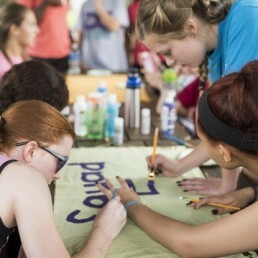 If you are a woman ages 19-35, you could become a Camp Counselor for TRUE Daughters. Our camp is held annually over the Labor Day weekend. It is beneficial if you’ve attended one of our camps before as a participant, but not a requirement. If you are interested in becoming a counselor, please submit your application by April 24, 2019 at midnight. If you were referred by someone and the deadline has passed, go ahead and submit the application but try to do so by May 8. If selected, the applicant will attend a Counselor training weekend in Greensboro, NC the weekend of July 19-21, 2019. Counselors also need to arrive at Camp a day early to help get things ready. C.I.L.T. stands for Camper in Leadership Training. Girls who are 17 – 18 years of age, have attended at least one of our past camps, and have shown interest in becoming a Counselor themselves can apply to be a CILT. Storyteller: Delivers excellence through audio, video, set design, and photography. Memory Maker: Makes camp special for the participants by turning activities into a memory of a lifetime (i.e. positive pranks, dance parties, surprises). Inspirer: Works with middle school girls, sharing your passionate love for Jesus and building relationship with the girls in your cabin. Submit an Application using the button below. Please submit by April 24, 2019 at midnight. Have three different people fill out a Reference Form on your behalf. If selected, the applicant will need to attend a training weekend in Greensboro, NC the weekend of July 19-21, 2019.